Howell Donaldson (Howell Emanuel Donaldson III) an alleged American serial killer known as the Seminole Heights serial killer and the Tampa Bay Serial Killer. Donaldson is believed to have murdered four people in the Seminole Heights neighborhood of Tampa in 2017. All four victims were shot dead seemingly at random. Serial Killer Howell Donaldson (aka) Seminole Heights serial killer, Tampa Bay Serial Killer, was active for 1 year in 2017, known to have ( 4 confirmed / 4 possible ) victims. This Serial Killer was active in the following countries: United States. Howell Donaldson was born on January 26th 1993 in North Carolina. He was born 2nd of 3 children and raised by both parents. He was raised as a middle child and had two, a younger brother and an older sister. His father, Howell Donaldson Jr.. His mother, Rosita Donaldson. He completed 16 years of school, received a college degree. In 2017 (Age 23/24) Howell Donaldson started his killing spree, during his crimes as a serial killer he was known to murder his victims. Howell Donaldson used a weapon and was in possession of a firearm during his crimes. Howell Donaldson has been listed on Killer.Cloud since April of 2019 and was last updated 1 week ago. The following serial killers were active during the same time span as Howell Donaldson (2017-2017). The Seminole Heights serial killer is an alleged serial killer who is believed to have murdered four people in the Seminole Heights neighborhood of Tampa, Florida, in October and November 2017. All four victims were shot dead seemingly at random. On November 28, 2017, police arrested Howell Emanuel Donaldson III after he handed a pistol in a bag to his manager, who alerted police. Q44077035 on www.wikidata.org, Retrieved on Apr 4, 2019. Seminole Heights serial killer on en.wikipedia.org, Retrieved on Apr 4, 2019. Eric Levenson, What we know about Tampa's alleged serial killer on www.cnn.com, Retrieved on Apr 4, 2019. Booking# 2017-42592, Arrest Inquiry - Search | HCSO on webapps.hcso.tampa.fl.us, Retrieved on Apr 4, 2019. Michael Paluska, ‘We are going to win:’ Parents tell accused Seminole Heights serial killer in new jailhouse video on www.abcactionnews.com, Retrieved on Apr 4, 2019. 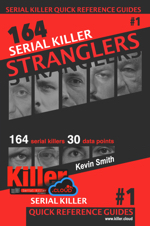 Serial Killers Statistics, charts Howell Donaldson is included in: Serial Killers By Gender, Age of Serial Killer by Date, Killers By Astrological Sign, Serial Killers IQ Level, Highest Degree Achieved, Birth Category, Active Serial Killers by Year and Statistical Boolean Questions.